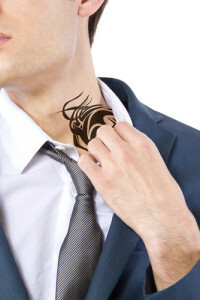 In our parents’ generation, tattoos were a big no-no for professionals. Having a visible tattoo was enough to get your resume sent to the trash. And, if you were hired, you may be forced to either get the tattoo removed or keep it covered when in the office. Things are different these days, but the numbers show that visibly tattooed and pierced people are still at a disadvantage. Even though it’s not as bad as it used to be, it’s still something to be aware of during your job search. There’s little data on this, but it’s safe to assume that a crazy hairstyle or hair dyed to an unnatural color could also have a negative impact. Especially considering that a third of bosses know whether they will hire someone within the first 90 seconds, and that 55% of the impact when meeting someone comes from their appearances and demeanor. Such beliefs are unfortunate and possibly discriminatory, especially considering a third of all people between 25 and 30 years old have at least one tattoo according to the survey by Working World. The good news is that the survey didn’t differentiate between industries, so depending on your line of work you might have no issues. There seems to be a growing trend of companies – even enormous ones like Starbucks – not caring about personal appearance too much. Can you imagine that happening a couple decades ago? Piercings, however, seem to make more of a negative impact. A study conducted by Iowa State University asked college students and working adults to look at resumes accompanied with a picture. Half the photos were altered to include piercings on the fictional applicants. Both adults and college students found the pierced applicants to be less employable. Surprisingly, the students judged the pierced applicants more severely than the adults did. If you’re seeking a job, the sad truth is that you might have to decide between personal expression and a better chance of being hired. When it comes to your personal brand, tattoos and piercings can do a lot more damage than a typo on your resume. Covering up tattoos is always a good idea but not always possible. If you have one that can’t be hidden during an interview, it may be best to ask about the company’s policy. That way, you’ll know straight away if it’s hurting your chances of getting hired. Opt for low-key, classic jewelry like a nice pair of diamond studs if possible. Don’t hide your piercing before the interview because the employer might not appreciate the surprise when you show up with piercings on the first day. Don’t bring up piercings unless the interviewer does. The surveyed perception of employers can be depressing, but don’t let it get you down. If a place won’t choose a qualified person because of his or her tattoos or piercings, it’s the company’s loss. Change is happening, even if it’s not happening as quickly as it should.